Before the creation of Insidius Infernus, Luciferia and Ungod were participating in other bands, Ungod as a drummer and Luciferia as a singer. 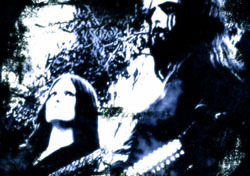 The decision to form this black metal band was taken due to the fact that they couldn’t express themselves through other bands or communicate in a fine level with other musicians. Ungod is the owner of Metal Throne Productions.